In my latest novel, “Come From Away” (set on the Eastern Shore of Nova Scotia, Canada during WW2), Grace Baker’s three brothers head overseas with the Army, the Navy, and the Merchant Navy. Grace stays behind to help her family and run the community’s General Store, supplying locals with food, supplies, and news. 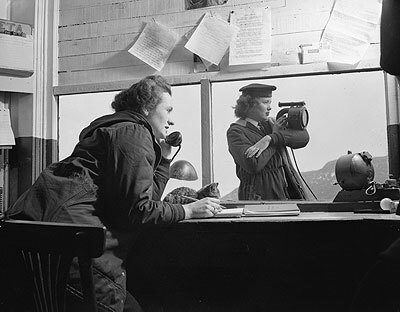 Her best friend, Linda, helps run the area’s switchboard in her father’s home. They might not think so, but in their day to day lives they both played vital roles for the people at home. Obviously, women’s traditional roles still existed, but they changed during war times. In addition to dealing with rationing, giving blood, joining military-related volunteer organizations, and buying war bonds, they helped the war effort with donations of pots, pans, aluminum foil, and other items for scrap metal drives, following the slogan, “Use it Up, Wear it Out, Make it Do, or Do Without.” Every house had a basket of wool for women knitting socks and sweaters for the men overseas, and women’s hands and nights were busy with the job of making quilts, bandages, and clothing to send along. Books and newspapers were sent to military hospitals. Practically everything in life was geared towards helping the military effort. But not all the women stayed home. During WWI, over 2800 Canadian women put their lives in danger by serving as nurses alongside the Canadian Army Medical Corps. Wearing their trademark blue dresses and white veils, the compassionate and courageous ‘bluebirds’ were often within enemy range, sometimes caring for downed soldiers close to the front line. In WW2, almost twice as many Canadian women served as nurses both in Canada and overseas, trading in their blue dresses for official military uniforms topped by white veils, since many of the “Nursing Sisters” came from religious orders. Canadian women were still not permitted to fight in the war; however, for the first time, nursing was not the only military role open to them, and hundreds of thousands of Canadian women stepped into positions left vacant by the fighting men. In 1941, the Royal Canadian Air Force created their Women’s Division (17,000 members), which carried the dubious slogan of “We serve that men may fly”. The Canadian Women’s Army Corps (21,000 members) started up soon afterward and was followed the following summer by the Women’s Royal Canadian Naval Service (7,000 members), better known as ‘WReNS’, like their British counterparts. At first, women stepped into the most basic roles, becoming paid cooks and cleaners, or clerical and administrative workers, but as time passed, these duties expanded to include previously male-oriented jobs like truck and ambulance drivers, mechanics, and radar operators. Things got even more interesting when some women became code breakers and spies. In time, of course, the war ended. And the men fortunate enough to come home discovered their jobs were being very well handled by their wives, sisters, daughters, and mothers. So what happened then? These days, we’d all jump up and naturally back women’s right to work (and be paid! ), but back then? You’d be surprised. I’ll leave you with this CBC discussion about ‘the role of women after the war’, featuring very interesting perspectives from four women of the Canadian Armed Forces and one lone male. Put yourself back seventy years … what might you have said?